I expect many of you are gearing up for the Broad Street Run on Sunday. I'm gearing up my post-race party preparation! The party's taking place at 63 N. Wiota Street - see directions here. If you would like to bring anything - food or drink - you'll need to come drop it off on Saturday sometime. Call Julia at 609-433-1394 if you would like to do that. No need to bring anything, though. There'll be food and drink aplenty. And also a dog (not edible). May's Bike to Run. Saturday, May 12 10am. 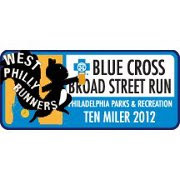 Usually B2R is the first Saturday of the month, but I decided to push it back in May for Broad Street Run. The destination and route are still being devised, but the details will be available at the B2R page. Wissahickon Wanderers Spring Trail Race Series. Thursdays in May at 6:30. Run in these informal trail races organized by the Wissahickon Wanderers the LAST FOUR Thursday evenings in May. The distances range generally from three to five miles through the woods of the Wissahickon and along Forbidden Drive. Meet at the Valley Green Inn. ODDyssey Half Marathon. Saturday, May 26. This race is super fun. Dress up, run a half. Sign up for our WPR group under my name and join us afterwards at the beer tent! More info at the race site.